With the rainy season upon us here in Trinidad and Tobago comes many wonderful sights around where I live: The hills turn from a hay yellow with spots of light green here and there, to a lush, vibrant viridian; Meagre ravines and rivers become swollen and teeming with life once more; Guabine ( Hoplias malabaricus), Teta ( Hypostomus robinii) and Coscarob (Aequidens pulcher) make their homes under dark rocks in the cool, serene mountain pools; birds of every imaginable colour sing their praise high in the canopy with Kiskadee (Pitangus sulphuratus), Semp (Violaceous Euphonia), Blue Jean (Thraupis episcopus, Blue-Grey Tanager) and Big Eye Grieve (Turdus nudigenis) in one accord….. of course hidden in holes at the river bank or between crevices and cracks in the rocks there is also Mr Crab…. 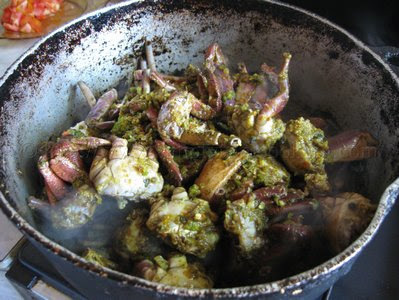 Up in the mountains here in Maracas we have mountain crab (Pseudotelphusa garmani) or what we call brown crab which is abundant during the rainy season and of course grace many a pot in the best way we know to serve crab: curried with dumpling. 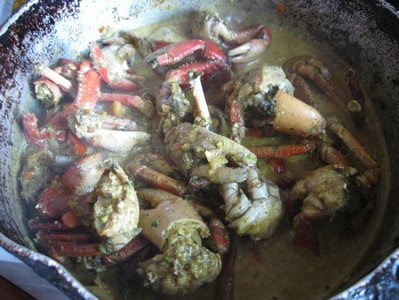 Of course when it comes to curry crab we’re not that choosy because any kind would make a good pot. 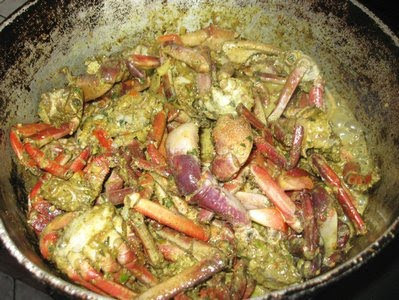 So, when I saw that we got some crab the other day, the first thing that ran through my mind was a good pot of curry crab and dumpling. 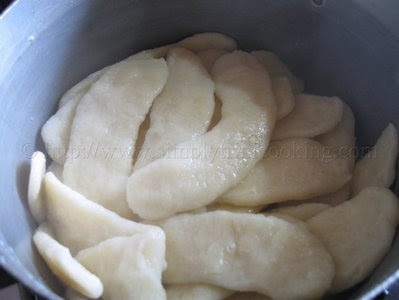 But seeing that we already did dumpling so many times I decided to post cassava dumpling instead: a wonderful variation that’s wholesome and rich in fibre. In the end it was a treat I thoroughly enjoyed. 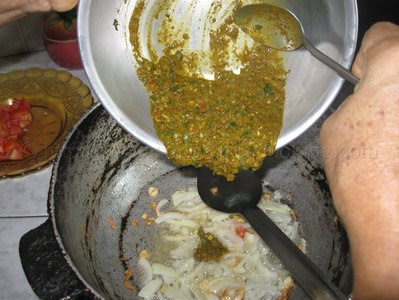 At one time during my feast, the lime pepper sauce got the better of me and made me cough. 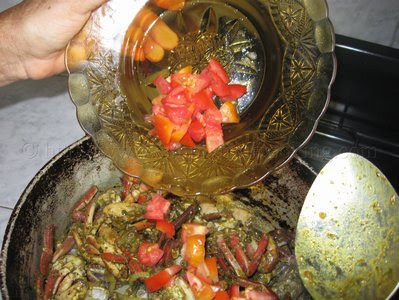 As we say in Trini “it went down de wrong throat” 😀 Boy that pepper is flamin’ ! Anyhow, enough of me and my adventures. 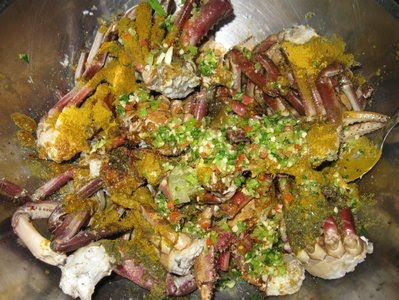 Now it’s your turn to try this local recipe that every Trini loves: Curry crab and Cassava Dumpling. 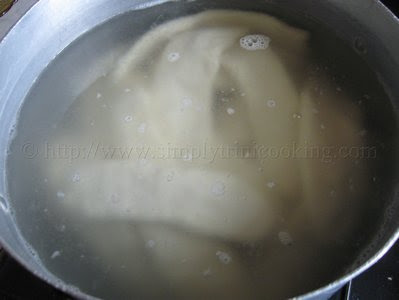 Place in a cloth and squeeze out the excess water. 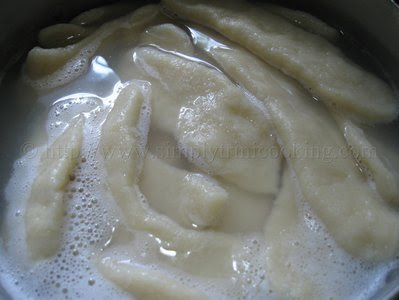 add water to the “cassava water” to make 1 cup. 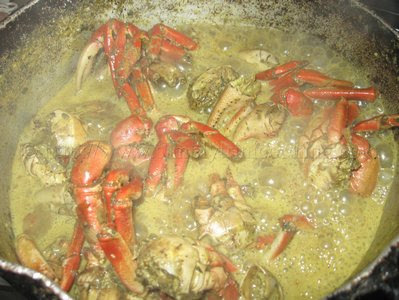 Wash and clean the crab, then scald with hot water. 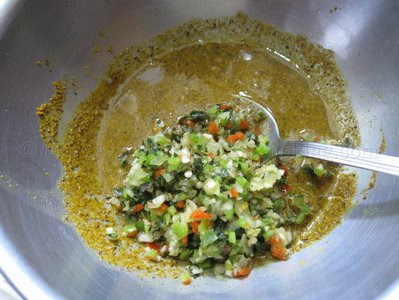 and half of the; chopped pimento, chadon beni, garlic and pepper sauce mixture. 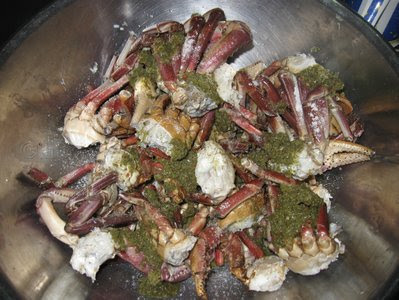 Note: The chopped pimento, chadon beni, garlic and pepper sauce is mixed in a bowl before adding to the crab. 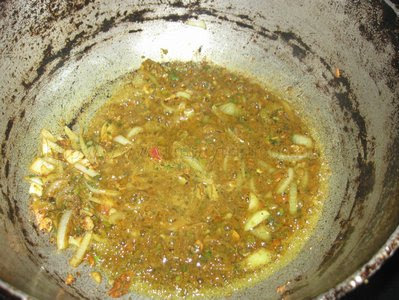 Also, we used some of the lime pepper sauce. 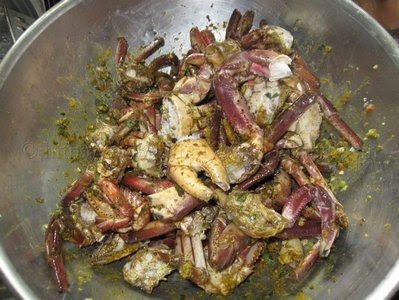 Mix up the crab and crack the gundy (claws) to allow the curry to infuse when cooking. 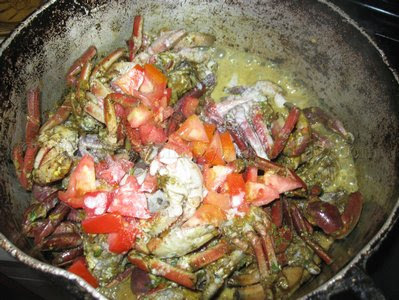 The crab is ready now but one more step before we start to curry. 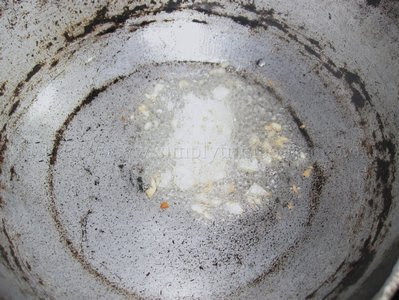 the other half of the seasoning mixture in 1/3 cup water. 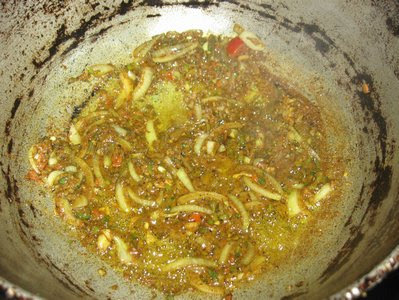 Heat the oil over medium heat and add the garlic and onion. 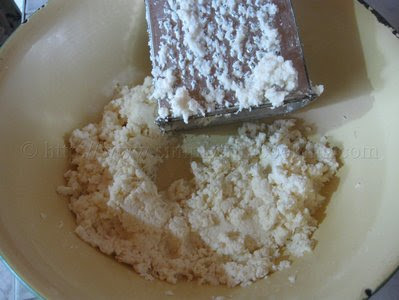 Mix the coconut powder in 1/2 cup water. 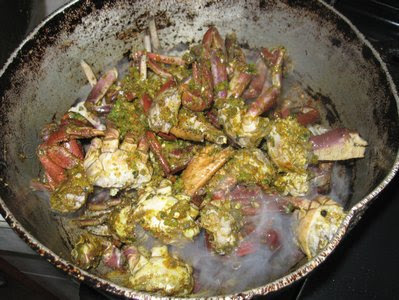 Add the coconut milk to the crab. 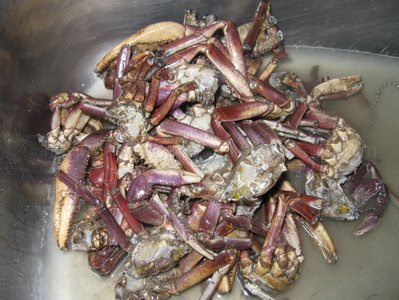 The crab is good now. 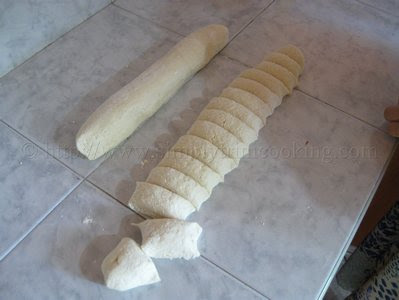 Serve over cassava dumpling and enjoy. 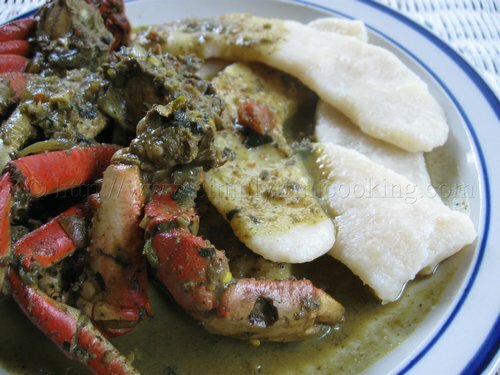 I hope you enjoyed the Trini curry crab and cassava dumpling- more recipes to come. 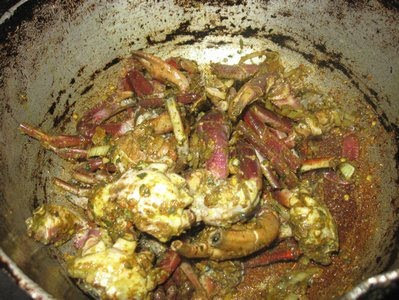 I really enjoyed reading your post and looking at the excellent photos.I cannot wait to make it…I love crab and I love curry. Can’t wait till your next post. I have a favor to ask. I follow you on Twitter and I get a feedburner update of all your blog entries sent to my google email. I am happy to do anything I can to support you. Your blog is terrific. But might I ask you to go to my blog and click on my google follow button and become a follower? There is nothing else required as a result of your “click”. 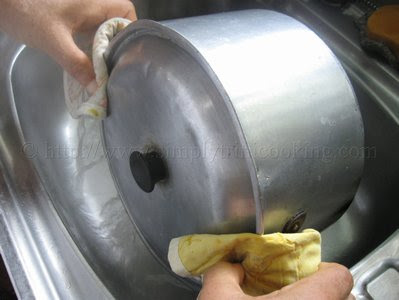 If you enjoy my entries and wish to get blog updates, I also have a feedburner link to email. But mostly I appreciate the google follow on the blog. I do believe that you already follow me on TWITTER. 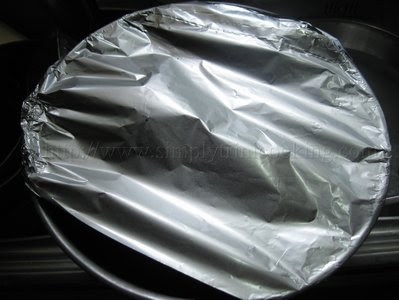 If you would like to talk with me directly, please email me at [email protected] and my blog address is http://lobstersandwich.blogspot.com/. 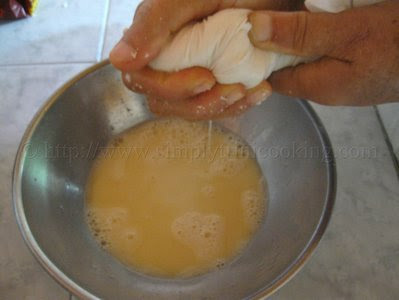 I would really appreciate your feedback, your comments and your support and your “follow” on the blog. Wow! Saucy I believe this is my longest comment to date and I thank you immensely. Well, I stopped by your site and did join as you asked. If you follow me on twitter then I surely follow you since I reciprocate any follow. I hope you enjoy the tweets! Thanks so much,Felix. I really appreciate it. 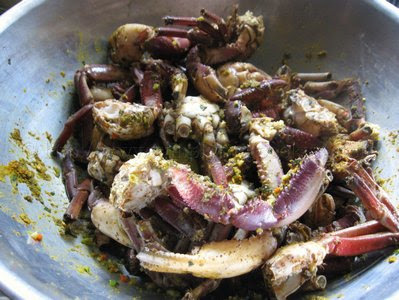 Looking forward to lots more great cooking from you!! 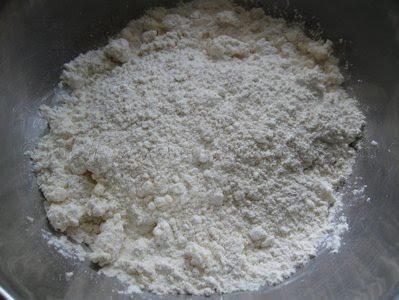 You can check a West Indian market for the coconut milk powder if not then you may have to make it. Email me if you have any other questions. Thank you for your comment. 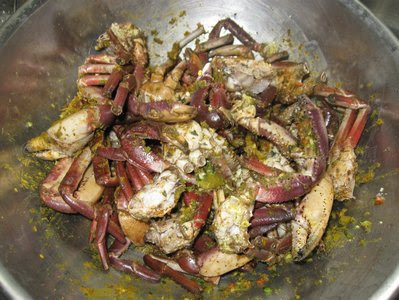 This looks so delicious, I have never tried curry crab.. Its almost crab season here, I will have to try this. 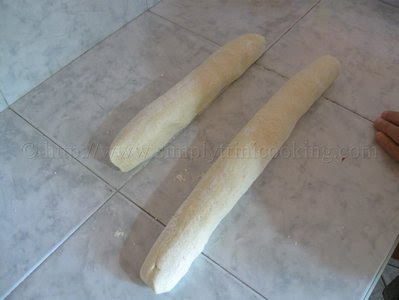 Thanks..
Why do you use coconut milk powder? 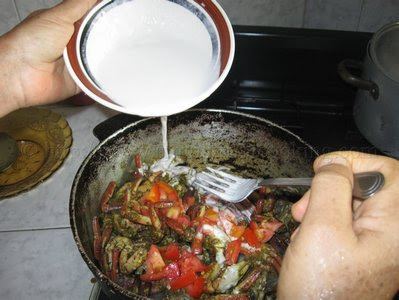 Why not just regular coconut milk? 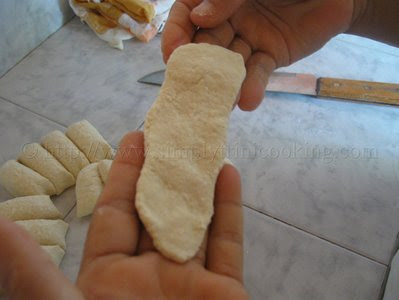 I chose to use milk powder just for simplicity and to cut down on preparation time. 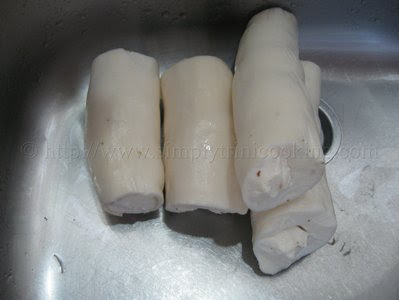 Making coconut milk from scratch is a time consuming process. 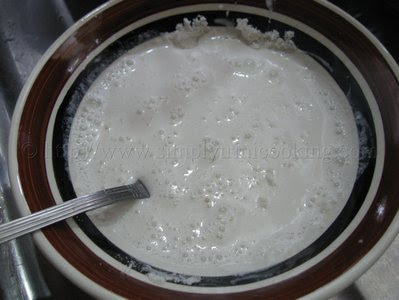 But if you want to you can use coconut milk instead of the milk powder. 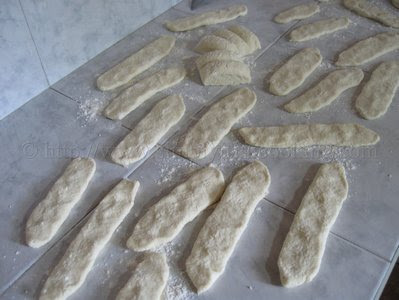 I’ll add the amount in the recipe. Thanks for writing. 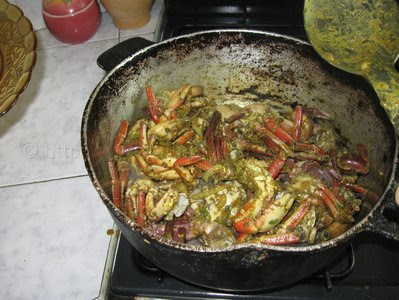 bought some crab claws this weekend and was looking for a good recipe to make crab and dumplings…..goin to try and let you know….i couldn’t get coconut milk/powder where i live so hoping it’ll still taste good without. 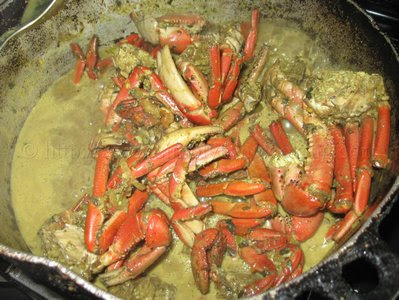 Make me wish i wasn’t allergic to crab. 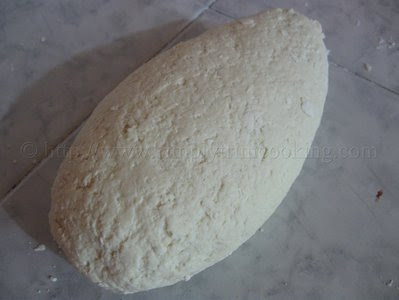 my mom would use just water in place of coconut mil k or milk powder, does it make a difference? 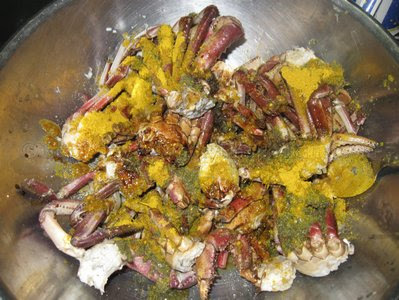 Basically you boil down the curry n crab till it dry right? 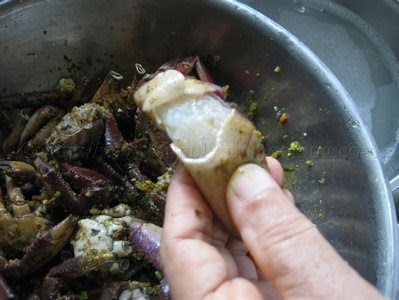 Coconut milk adds more flavour to the curry but boil it too dry you have to leave enough for sauce. 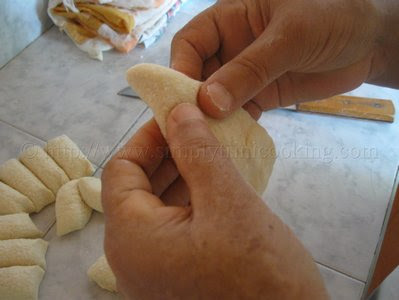 Just wondering if there’s a reason you didn’t put salt in the dough for the dumpling.